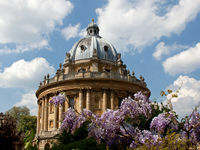 Best known for its world-famous university, Oxford is one of the UK's top tourist destinations. This page gives details of Oxford's top ten things to do. 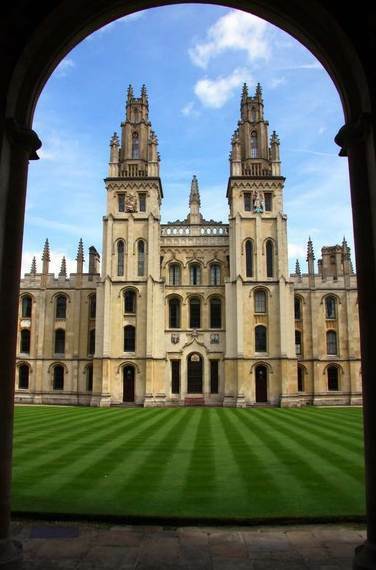 We start with Oxford University's 38 colleges, and their fantastic architecture and gardens. Magdalen College even has a deer park. Then there are the University's museums: the Ashmolean Museum is the premier attraction, with a diverse range of exhibits such as a lantern used by Guy Fawkes and a jewel commissioned by Alfred the Great. The Bodelian Library, and in particular its central Radcliffe Camera, is another great place to visit: it dates from 1602 and has been used by five kings and 50 Nobel laureates. For nature enthusiasts, the must-see attractions are the Museum of Natural History and Botanical Gardens. Oxford's other places to visit are the Museum of the History of Science (where you can see items as diverse as astrolabes and a blackboard used by Einstein), the Sheldonian Theatre (used for the University's ceremonial occasions), and the Pitt Rivers Museum (displaying archaeological finds from around the world). Further afield, why not take a relaxing walk across Port Meadow (the inspiration for Alice in Wonderland) or visit the landmark Blenheim Palace (a UNESCO cite dating from 1724 and still home to the Duke and Duchess of Marlbourogh). 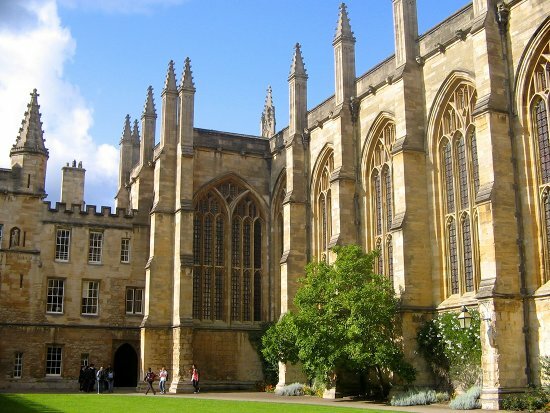 The University of Oxford, formed in the 11th century, is the oldest university in the English-speaking world. It is one of the world's foremost educational establishments, having taught over 40 Nobel laureates and 50 world leaders. All students and academic staff belong to one of Oxford's 38 colleges. Those colleges fulfill educational and pastoral roles, providing tutorials and accommodation for undergraduates. A typical college comprises a hall for dining; a library; a bar; senior, middle and junior common rooms (for dons, postgraduates and undergraduates respectively); a chapel; and accommodation for around 300 undergrads, the head of the college and its dons. Given the age of the university, many colleges contain impressive architecture and grounds. 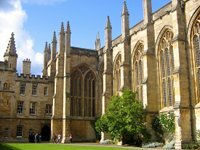 We particularly recommend the twin gothic towers of All Soul College's great quad (pictured); Christ Church College's great hall (featured in the Harry Potter films, and where former students including John Locke, Lewis Carroll, W.H. Auden and Albert Einstein will have dined); Magdalen College's deer park; the old city walls found in the grounds of New College; Lincoln College's glorious chapel; and Worcester College's pretty gardens and lake. where? 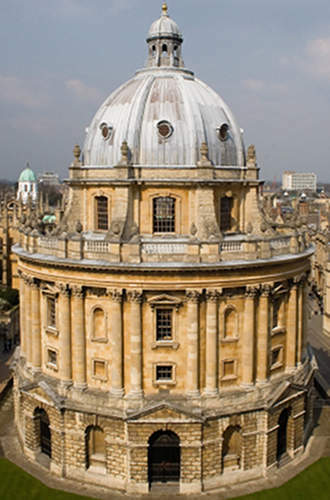 The colleges are located within easy walking distance of central Oxford. when? Most colleges welcome visitors all year round. Full details are available on the Oxford University website. £$€¥ Entrance to many colleges is free. Built between 1678 and 1683, the Ashmolean Museum of Art and Archaeology was the world's first university museum. 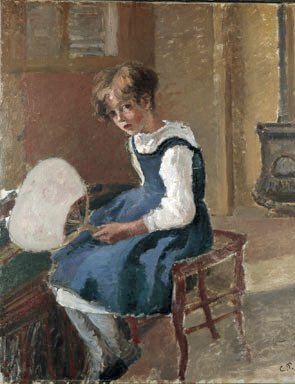 It houses five principal collections, namely Antiques, Western Art, Eastern Art, The Heberden Coin Room and The Cast Gallery. Works of particular note include a Neolithic human skull, a lantern used by Guy Fawkes, The Alfred Jewel (commissioned by King Alfred the Great, pictured), a Stradivarius violin, drawing and prints by Raphael, Leonardo and Rembrandt, Ming pottery, and a number of paintings, prints and drawings by members of the Pissarro family (one of which is pictured). The museum has undergone extensive renovations in recent years and now houses a restaurant and large gift shop. where? The Museum's collection is displayed in 67 galleries, arranged over five floors. The Museum is on Beaumont Street, opposite the Randolph Hotel. when? Tues to Sun 10 am to 6pm (and Bank Holiday Mondays). Dating from 1602, the Bodleian Library is the principal research library of the University of Oxford and the second largest library in the United Kingdom. IIt is housed in five buildings close to Broad Street and a number of other off-site storage areas and specialist libraries. In total, the library holds 11 million books displayed on 117 miles of shelving. The oldest building, Duke Humfrey's library, is open to the public. It has the distinction of having been used by five kings, 40 Nobel Prize winners, 25 British Prime Ministers and writers such as Oscar Wilde, C S Lewis and J R R Tolkien. The next oldest building, the Tower of the Five Orders, has featured in a number of Harry Potter films. The third eldest, the Radcliffe Camera (pictured), is perhaps the most spectacular. And the Clarendon Building (c. 1711) and New Bodleian (c. 1940) are more recent editions. where? The ticket office is found at the Great Gate to the Bodleian Library, on Catte Street. Tel: +44 (0)1865 277224.
when? Guided tours take place all year round (when the buildings are not needed for special events). £$€¥ £6.50 for the standard tour. No concessions. Housed in a spectacular neo-Gothic building, the Oxford University Museum of Natural History is best known for housing four specimens of Oxfordshire dinosaur, an exceptionally well preserved Dodo, and a large number of swifts which nest each year in a ventilation duct in its main tower. The Museum's exhibits are arranged into four collections. The entomology collection holds over 5 million specimens, including a fascinating butterfly collection, and a large working bee hive. The geology collection holds 375,000 specimens, including Jurassic vertebrates and invertebrates; outside, the museum's front lawn contains a 60 metre track featuring dinosaur footprints. The mineralogy and petrology collection holds 30,000 mineral specimens from all over the world, including gemstones and meteorites. And the zoology collection holds 250,000 specimens including the most complete remains of a dodo anywhere in the world, Darwin's collection of crustacea and William Turton's mollusc collection. where? Oxford University Museum of Natural History, Parks Road, Oxford, OX1 3PW. T: +44 1865 272 950.
when? 10am to 5pm, 7 days a week. Contact the Museum for Christmas and Holiday opening hours. Port Meadow is a 440-acre area of common land to the north and west of Oxford, and provides a perfect spot for a country walk. The Meadow has a distinguished history, having been given to the Freemen of Oxford by Alfred the Great for their efforts in helping to defend the country against the invading Danes; the Freeman's right to graze their animals on the Meadow, recorded in the Doomsday Book of 1086, still exists to this day. Port Meadow is adjacent to the Thames (called the Isis at this point), and has flora and fauna typical of an English flood meadow, including geese, gulls, birds of prey (including peregrine, buzzards, sparrowhawks and kestrels), migratory birds, horses and cattle. Lewis Caroll is said to have had the inspiration for Alice's Adventures in Wonderland when rowing a boat down the adjacent Isis. where? 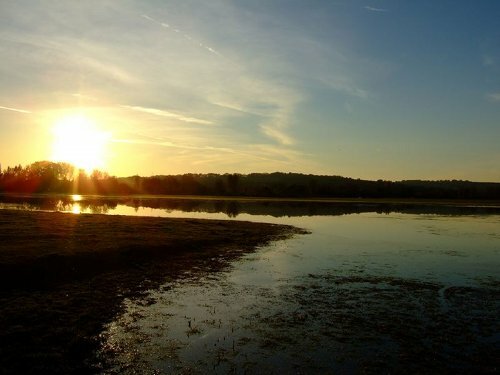 Port Meadow is accessed by Walton Well Road or Aristotle Lane (in the south) or from Wolvercote (in the north). A favourite amongst locals is the hour-long walk from central Oxford to the Trout Inn in Wolvercote for lunch or refreshment, before making the return journey. 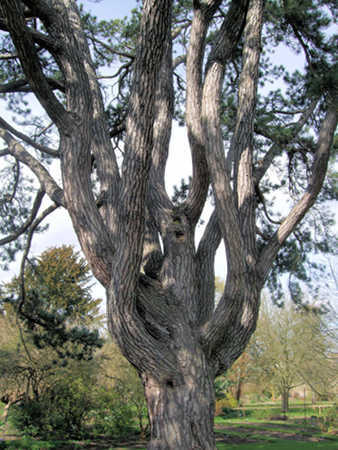 The Oxford Botanical Gardens, founded in 1621 and the oldest botanical gardens in Great Britain, hold over 7,000 species of plant in its 4.5 acres. The Gardens are arranged into three sections. The first is the Garden's various glasshouses: the Conservatory contains plants commonly grown in the home; the large Victoria cruziana lily can be seen in the Lily House; the Insectivorous House is home to plants from swamps and marshes such as the Venus fly trap; and the Alpine, Palm and Arid Houses complete the collection. The second section is the walled garden, which comprises rectangular botanical family borders first laid out in 1884; one of the newest additions is the Medical Plant collection, grouped according to which part of the body the plants act on, and containing plants which are used in the treatment of conditions ranging from heart arrhythmias to cancer. The third section, 'Outside the Walled Gardens', contains Water and Rock Gardens, Herbaceous and Autumn Borders, and Vegetable Beds. A relaxing and educational day out. when? Nov to Feb: 9am to 4.30pm; May to Aug: 9 am to 6pm; Other times: 9am to 5pm. £$€¥ Adult: £3.80; Concession: £3; Accompanied children go free. 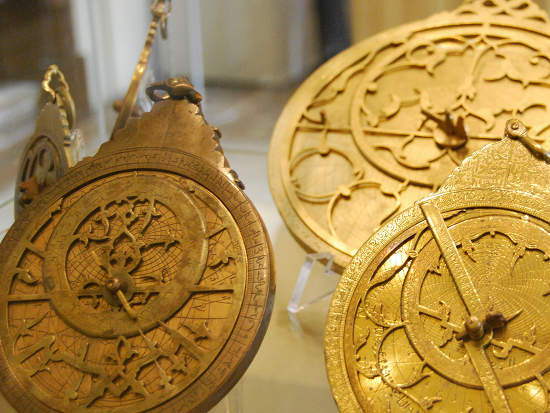 Founded in 1683 to house Elias Ashmole's collection of scientific instruments, the Museum of the History of Science now holds close to 20,000 items dating from medieval times to the early twentieth century. 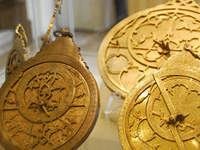 They include astrolabes (ancient astronomical computers, pictured), sundials, globes, clocks, early perpetual calendars, telescopes, cameras and early mathematical instruments. The Museum also houses a large library. Its highlights include the blackboard used by Albert Einstein to explain his theories of relativity during his 1931 lecture series in Oxford, Lewis Caroll's photographic kit, and Mosely's notes on the periodic table. The Museum has some interactive displays for children, and is a must-see for science enthusiasts. where? Museum of the History of Science, Broad Street, Oxford OX1 3AZ. T. 01865 277 280.
when? Tues-Fri: 12pm-5pm. Sat: 10am-5pm. Sun: 2pm-5pm. Closed Mondays. 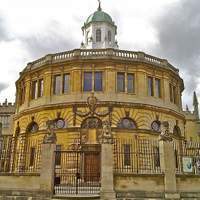 Built between 1664 and 1668, the Sir Christopher Wren designed Sheldonian Theatre is today used for public concerts and private Oxford University ceremonies and events. Based on the Marcellus Roman theatre, the Sheldonian’s auditorium spans 70 by 80 feet; tiered seating for between 800 and 1000 ascends from a central wooden floor, with large timber sash windows sitting just below the Robert Streater painted ceiling. Streater painted the ceiling in his Westminster studio between 1668-9, with the 32 panels then transported to Oxford by barge. Entitled 'Truth descending upon the Arts and Sciences to expel Ignorance from the University', the panels were extensively restored during the eighteenth and nineteenth centuries. Other notable interior features are the 1876 Sir Thomas Jackson organ and a Henry Cheere statue of King Charles II. Visitors should also inspect two exterior features, the pretty 1838 Edward Blore eight-sided cupola and the Caesars’ Heads sitting on columns on the Broad Street boundary wall. 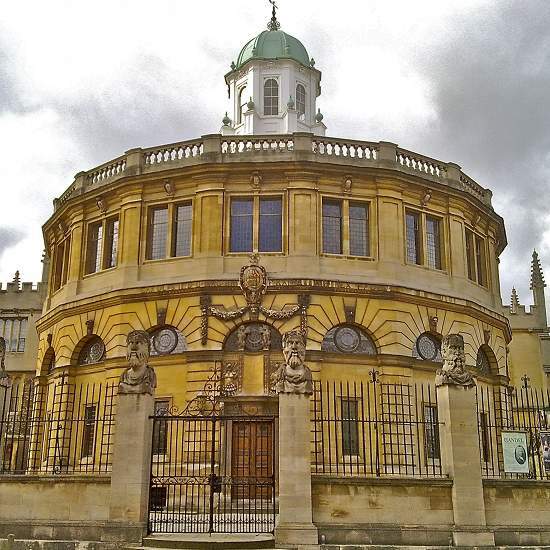 Today, the Sheldonian Theatre is used for classical concerts, lectures and for matriculation and graduation ceremonies (the former being a ceremony by which new students, wearing full academic dress, are formally entered into the register of the university). The Theatre is a fitting monument to Gilbert Sheldon, chancellor of the university between 1667-9 and the Theatre’s principal original benefactor. when? Mon to Sat. 10.00am to 12.30pm; 2pm to 4.30pm (Mar to Oct); 2pm to 3.30pm (Nov to Feb). £$€¥ Adults: £2.50; Concessions: £1.50. 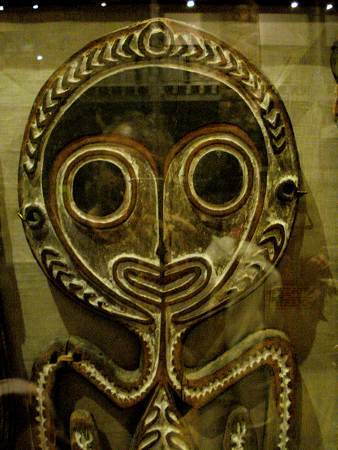 Founded in 1844 by Lieutenant-General Pitt Rivers, this eponymous museum houses over half a million archaeological and ethnographic objects from all over the world. The collection is arranged thematically, according to how objects are used. The 'Defensive Weapons', 'Methods of Making Fire', 'African Metalworking', 'Masks, Animals and beliefs: Ancient Egypt' and 'Body Arts: Scarification' collections are especially interesting. The museum is one of the departments of the University of Oxford, attracts over 250,000 visitors a year, and is extremely family friendly. where? The entrance to the Pitt Rivers Museum is through the Oxford University Museum Natural History (see below) on Parks Road, Oxford, OX1 3PW. when? 10 am to 4.30 pm Tues to Sun (and bank holiday Mondays); noon to 4.30 pm Mon. 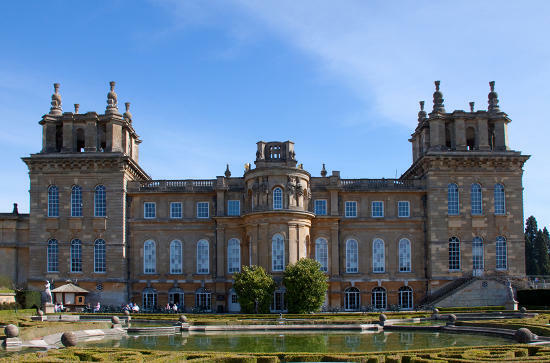 Recognised as a UNESCO world heritage site in 1987, Blenheim Palace was built between 1705 and 1724 and is a monumental country house which is still home to the Duke and Duchess of Marlborough. Blenheim was designed in English Baroque style by Sir John Vanbrugh; was funded in part by funds granted by Parliament (on the orders of Queen Anne) in recognition of the Duke’s military successes; and is the birthplace and ancestral home of former Prime Minister Sir Winston Churchill. Covering an area of 28,000 square metres, Blenheim Palace was intended by its architect to be viewed at a distance so as not to appear weighed down by too much ornamentation. The state apartments—such as the 67-foot high dining saloon and the Christopher Wren designed, 55-metre long library—are found along the front façade. The private apartments of the Duke and Duchess are located on the east side and a long picture gallery to the west. The interior is sumptuously decorated, housing delights such as Sevres porcelain, the Blenheim Tapestry, murals by Louis Laguerre, portraits of Queen Anne and William III, and a grand Willis organ. Outside, the 2,000 acres of landscaped grounds house delights such as the Column of Victory (a 41-metre high monument, with a statue of the First Duke at its apex), the Great Lake, a number of follies and the Italian, secret and rose gardens. Other attractions include a maze (the second largest in the world), adventure playground, butterfly house and mini-train. where? Blenheim Palace, Woodstock, Oxfordshire, England OX20 1PP. when? Feb to early Nov: daily from 10.30am to 5.30pm. Early Nov to Feb: only Weds to Sun. £$€¥ Adults: £21; Concessions: £16.50; Children: £11.50.